House Majority Leader Rodolfo Fariñas on Monday criticized senators for insisting on inter-parliamentary courtesy in dealing with Senator Leila de Lima. Speaking to reporters inside the Batasang Pambansa, he argued inter-chamber courtesy dictates that he "will not comment on what they are doing." To do otherwise, he added, would only result in a rift. "Pero sila ngayon, pinu-puna-puna kami dito, akala mo mga supervisor namin sila. Hindi namin supervisor yang mga senador na yan ah. And then they are saying 'dapat ganito, dapat ganito.' Why will they teach us how we conduct our business? We're not teaching them how they conduct their business," he said. Senate President Aquilino "Koko" Pimentel III earlier refused to take action on complaints by members of the House of Representatives regarding inter-parliamentary courtesy after Senator Leila de Lima allegedly advised her former driver and bodyguard Ronnie Dayan not to honor the subpoena issued to him. According to Pimentel, it is better for both the House and the Senate to finish its respective inquiries on the issue. He added that the House should first finish their investigation and inform them about their findings before asking the Senate to take action. 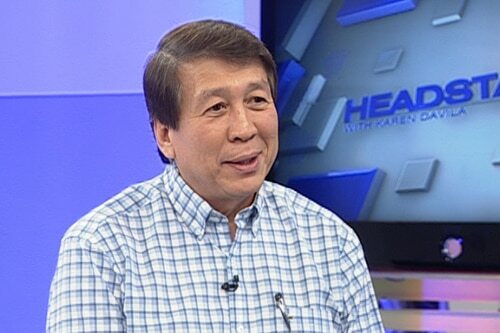 Fariñas said Dayan was invited to the House inquiry on the alleged Bilibid drug trade after several congressional witnesses tagged the driver as a conduit of drug payoffs. He said the House panel issued a subpoena for Dayan but not to De Lima in observance of inter-parliamentary courtesy. "We had to bring him doon sa committee ... Under our rules, hindi ka puwedeng magdala ng witness kung wala muna siyang affidavit para nakalista. So yung affidavit niya, ang sinabi niya doong: 'ako, gustong gusto kong mag-attend pero sinabihan po ako ni Senator De Lima na hindi mag-attend.'" Fariñas said De Lima's order for Dayan to snub the House inquiry shows contempt for the Lower House. "Contemptuous yun because first, they talk of courtesy, [but] where is the respect of Senator De Lima in the proceedings of the House? Kung ano-ano na nga ang tinatawag niya--sarswela lang yan and everything else," he said. He said the House of Representatives has three possible courses of action against De Lima. One, he said, would be a criminal case for contempt, in the level of the regional trial court, which will compel her to answer the complaint thereof. Two, the House may also file an administrative case before the Supreme Court on the grounds of ethical misconduct against De Lima, who is a member of the bar. "For a lawyer to tell a person who has been issued a subpoena duly signed by the Speaker, aadvise-an mo na wag pumunta, contempt na yun ng House," he said. The third option would be filing a complaint before the Senate Ethics Committee for "disorderly behavior." "'Yun, sila lang ang pwedeng mag-desisyon doon--kung susupendihin siya o tatanggalin siya na Senador. Sila lang ang pwedeng mag-desisyon doon; pero yung act of contempt against the House of Representatives, kami lang ang pwedeng mag-desisyon nun," he said. Fariñas added these three actions may be pursued at the same time. Fariñas also slammed critics who were critical of their line of questioning. He defended his question to Dayan about the "intensity" of their love for each other, using storm signals as a description. "Anong masama kung tinatanong ko yung pag-iibigan nila, eh very relevant ito? Sinabi niya, umabot ng signal number 5. At least, nakikita ko yung intensity and yung fervor ng pagmamahalan nila," he said. He said this goes back to Dayan's revelation that his former employer had urged him to go into hiding despite the House's subpoena. "Ang testimony, dapat mag-a-appear siya, pero dahil sinabihan siya ni Senator De Lima na magtago na lang siya, nagtago na lang siya. Kailangan malaman natin bakit niya susundin yan. Bakit mo susundin yan ganiyan?" he said. "Inestablish na mahal niya, kaya niya sinusunod dahil meron nga silang illicit relationships, meron silang ilegal na relation. Kaya nga, familiarity breeds contempt," he added. He added De Lima would not have ordered her driver to receive cash from someone else--as alleged by Dayan and Eastern Visayas drug lord Kerwin Espinosa--had they not been in a relationship. "Ikaw ba, gagawin mo, yung driver mo patatanggapin mo ng pera? Kailangan mo i-establish na may relasyon sila. Familiarity breeds contempt nga," he said. Fariñas also argued that his question on whether or not Dayan and De Lima were still living under one roof was relevant insofar as establishing the senator's possible concubinage offense. "Ang concubinage, naco-commit lang yan if you are living as husband and wife with a woman other than your wife. Kaya ko tinanong. Anong masama doon? Importante ito na malaman," he explained. Both De Lima and Dayan had recently admitted the relationship in separate occasions, but Fariñas maintained that they had to probe deeper into this relationship in their House inquiry. "You have to understand, ang testimony ni Dayan, siya ang nag-recommend kay [Rafael] Ragos to be the [Bureau of Corrections] head. Siya ang nag-recommend kay [Franklin] Bucayu to be the BuCor head. Talaga namang nakuha nila," he noted. "Kaya kailangan tanungin ko, ano bang relationship ninyo? Ano bang tindi ng relationship ninyo para pakinggan ka ni Senator De Lima?" He asserted if anyone had felt that he had done anything inappropriate, he is willing to waive his parliamentary immunity.